East Hook, a suburb in Liberty City in GTA IV. Got a question to ask? Found something cool? Create your own topic in the forum. 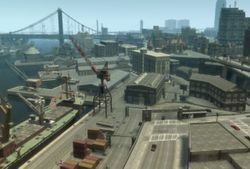 Liberty City in Grand Theft Auto IV has been remodeled to look much more like New York City compared to its GTA III Era renditions, featuring Broker (Brooklyn), Algonquin (Manhattan), Dukes (Queens) and Bohan (Bronx), with the neighbouring state of Alderney (New Jersey) also present. The total map area is slightly smaller than that of San Andreas, but is immensely more detailed and has no "wasted" open space such as countryside or desert. This page was last modified on 18 June 2010, at 22:57.